This ad was posted on April 13th. To contact the owner please register an account & log in. 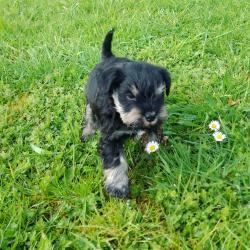 One beautiful miniature Schnauzer puppy available from a litter of two. Mother is Flavia Athena IKC reg and father is Fullcool Bobby McGee, Irish Champion dog. This puppy is black with a white star on her chest. She is a beautiful example of this wonderful breed. She loves attention and being held and cuddled. She is a very happy puppy. She will be ready to go to her new home in mid May. 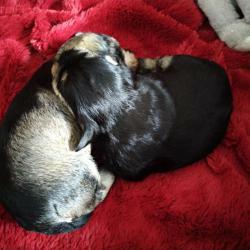 She is starting to eat solid food and is being weaned onto Royal Canin puppy food. 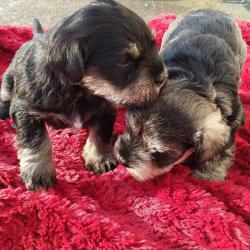 See other Schnauzers for sale.